The Curse of the Mummy—Strange Coincidences? Lord Carnarvon was the chief financial backer for the archaeological expedition that uncovered King Tut’s tomb. A few months after the tomb’s opening tragedy struck, Lord Carnarvon, age 57, was taken ill and rushed to Cairo. He died a few days later. The exact cause of death was not known, but it seemed to be from an infection started by an insect bite. Legend has it that when he died there was a short power failure and all the lights throughout Cairo went out. His son reported that back on his estate in England his favorite dog howled and suddenly dropped dead. 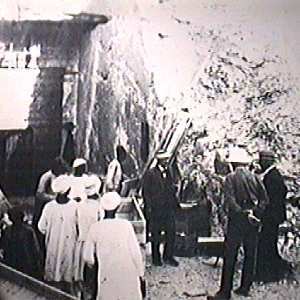 Photo taken outside the tomb of King Tut shortly after it was opened in 1922. Even more strange, when the mummy of Tutankhamen was unwrapped in 1925, it was found to have a wound on the left cheek in the same exact position as the insect bite on Carnarvon that lead to his death. What horrors did Westbury refer to? The press followed the deaths carefully attributing each new one to the “Mummy’s Curse” By 1935 they had credited 21 victims to King Tut. Was there really a curse? Or was it all just the ravings of a sensational press?